Readings: Searching for the Secret River by K Grenville, Writing Short Stories by F O'Connor, The Writing Experiment by H Smith, Explorations in Creative Writing by K Brophy, How Fiction Works by J Wood, An Ocurrence at Owl Creek Bridge by A Bierce, The Trail of Your Blood in the Snow by G Garcia Marquez, and Love and Honour and Pity and Pride and Compassion and Sacrifice by N Le. Admittedly, I had a busy weekend and didn't quite get a chance to read any of these (except that I'd read the last one a few years ago, which I loved). We discussed the circumstances we need in order to do our best writing, and how the requirements might change depending on what we are writing. For example, I hate working in silence, but I seem to generally work best when there is instrumental music in the background without lyrics. When I'm trying to concentrate, I'll put on a playlist of Yiruma or the musical scores of movies. Han Zimmer is a favourite on my Spotify account. However, waiting for ideal circumstance for writing is not going to help you make progress. Sometimes, you just have to get those ideas down as they come to you, even when you're in the middle of something. Just jot them down somewhere - in your smartphone, on a serviette, along your wrist, up your leg - because if you don't, there's such a chance of forgetting by the time the ideal circumstances come around. And that's part of the beauty of first drafts. You can get away with it being rough and imperfect. Starting out tends to be the hardest part, but once you've got something down on the page, you can work with it from there. Do not wait for time to write. Find time. Make time. Write. We talked a lot about short stories in class this week and noted that one of the rookie mistakes short story writers make is that they exclude details completely and think they're simply being subtle, but really, a little bit of what you're trying to imply needs to be in there in order for you to be subtle, otherwise how else is the reader to know it's supposed to be there? Short stories are about writing dramatic actions and emotions and too often, the author is hung up on wanting to write about problems, not people, and about abstract concepts rather than anything concrete, or they are caught up in the idea of being a writer, that they forget they actually need to be telling a story. So remember to keep the story in mind when you're writing, otherwise you're just rambling. Readings: A Ballad - After Villon by Tom Scott, Testimony, Theory, Testament: On Translating Francois Villon by Justin Clemens, Ballad of the Dead Ladies by Francois Villon, translated by Dante Gabriel Rossetti. Our question when we did the roll-call was: If you were a criminal, what would you cal yourself and what would be your specialty? We talked about Francois de Mentcorbier and Georges Villon, and ended up discussing a lot about medieval France. This is where the creation of la petite testament, la grande testament, and the ballad occurred. Our teacher also taught us the phrase memento mori: Remember that you will die. We read through the readings in class and talked about them and we noted that every culture seems to need demons, and every culture recreates them in one way or another. It's almost like they're trying to breed fear. Readings: Jack and the Beanstalk by Joseph Jacobs, Jack and the Beanstalks by Edwin Hartland, and Jack and the Beanstalk by Andrew Lang. This week focused on narrative theory and ideology and we applied what we learned to the three different version of Jack and the Beanstalk we read. This is something I feel my classes have covered a hundred times over, but I still found it useful. Reader positioning is the way the text influences the reader to adopt particular views of the characters and actions in the story. Then we talked about who the story is told to and who is listening: The real reader vs the implied reader/target audience vs who the narrator appears to be talking to within the story/the narratee. Then we discussed the question, who speaks? We talked about the real author vs the implied author (inferred by the reader from the text) vs the narrator. This led to a discussion about the different types of narrators. First person, as a participant or as an observer; third person, omniscient vs limited. We talked about intrusive/overt and un-intrusive/covert narrators, who either have a presence or character in the story, at least to a degree, or are identified as no more than a voice telling the story. We also discussed how to distinguish between having a reliable or an unreliable narrator: are they naive, ignorant, bias, or of dubious moral character? Can they be trusted, and how much can they be trusted? We talked about focalisation, often called point of view, which is the lens through which we see the story. Readings: Writing Personal Essays: On the Necessity of Turning Oneself into a Character by P Lopate, Sophie by JM Coetzee, A Farewell to Beirut by R Fisk, and Mother Tongue by A Tan. It's always interesting to see how the subjects covered in classes match up each week. We talked about narrative point of view in this class. In a personal essay, the 'I' must form a character as well as a narrator. This is done by selecting the aspects of yourself relevant to the story being told and applying them to the 'I' character. This includes the way we speak. Have you ever noticed that you change the way you speak according to who is around you? According to Russian philosopher Mikhail Bakhtin, we speak in genres. When writing a personal essay, we need to pick which genre our 'I' character should speak in, otherwise consistency is lost. In writing ourselves as an 'I' character, we also have to be mindful of showing our own character development, which means admitting to our own personal flaws and imperfections and putting them into words. What did you learn about writing this week? I keep a little notebook in my room and when I have an idea, or more often, a line that is stuck in my head, I write it down. It could be anything: something I overheard; something inspired by an event or things I have seen or done; or something I simply came up with out of the blue. Every now and then, I go back to this little book, just to see what's in there, and I'm always pleasantly surprised. The last thing I wrote in there was inspired by something I'd seen on Facebook, about a week ago. It was a list of mental health issues and their resulting actions that some people think there was something cool about, basically saying that people who think there's something cool about them are idiots. Somewhere in that list, a line jumped out at me and glued itself inside my head, so I reached over to my little notebook and wrote it down immediately, knowing it wasn't going to leave my head until I'd done so. "Suicide is not poetic," was the line. I don't know if I'll ever use this line, or if I'll ever be inspired to write something because of it. I'm a little conflicted about drawing inspiration from it, considering the whole point of the post was to say there is nothing 'cool' about such things, but then again, the post itself was ironic in that it had placed these things in a poetry of sorts. I guess with the right intentions being conveyed, I would be doing basically the same thing as whoever originally made that post. On a related note, I drew a bit of inspiration from an experience I had over the weekend. I was at a party with some of my writerly friends from university, it was dark, and the party was located on a small farm. The back paddock was full of really tall pine trees and there was a trampoline. We wandered up to the trampoline in the dark, save for our glow sticks and occasionally our phone lights, and we sat on the trampoline chatting away. It was creepy out there, to say the least, and of course us writerly folk were speculating what would happen if it turned out we had just stepped into a horror movie. Our mistake! It wasn't all that terrifying, but part of the group supposedly headed back towards the house before the rest of us, and then we noticed people without lights moving through the trees a little later. Of course we knew it was just our friends trying to scare us, but we all played along and tried to find them. We turned our phone lights back on and started wandering in the direction their voices and silhouettes had come from... and then we stumbled upon a small grave site, where there were crosses made of sticks in the ground. Oh my, that was a little creepier than I had anticipated. I mean, I'm pretty sure it was just where some dead pets had ended up, but still! The shenanigans in the back paddock ended shortly after that and we all went back down to the house, but it was heaps of fun despite the mild creepiness and I'm sure a few of us present will write about it at some point. Where have you gotten some of your inspiration from? Readings: 'It's Genre. Not that there's anything wrong with it!!' by A Krystal, 'The Circular Ruins' by JL Borges, 'The Second Bakery Attack' by Haruki Murakami, 'Lifelike and Josephine' by P Haines, and 'A Heartbreaking Work of Staggering Genius: A Memoir Based on a True Story' by D Eggers. This week was focused on the genre fiction vs literary fiction debate, which I personally thing is a silly thing to argue about. Both styles have their pros and cons and if they are executed right, are capable of being just as good as each other. The article we read by A Krystal was offensive to many of the genre-writers in the room and most if not all of us disagreed with what was being said. However, the aim of our class is to create something that falls under the heading of literary fiction. That's not to say we cannot write in a genre if we are writing literary fiction. It just means we have to write something that isn't commercial fiction, as commercial fiction seems to be the more general way of referring to all of the genre categories. The other readings were used as examples of literary fiction and helped us to define the term. A lot of people in the class were only hearing of literary fiction for the first time. The difference between genre/commercial fiction and literary fiction seems to be that, generally speaking, commercial fiction follows a familiar story-line and the reader knows what to expect from the book, the language and style is simple and straightforward and readers consider it fun, whereas literary fiction supposedly carries deeper and more complex messages, doesn't follow cliche story-lines or use the expected tropes, and the reader starts the book without really knowing what to expect, but the content resonates with real life. Personally, I think this is all bogus. There is genre fiction that has fancy language and complex issues and which resonates with us afterwards, and there is literary fiction that falls flat of that expectation of sweeping us off our feet. But I will share with you a quote from the article by Krystal: "One brings us fun or frightening gifts, the other requires - and repays - observance." What do you think of this? Readings: 'Vidal in Furs: Lyric Poetry, Narrative, and Masoch(ism)' by Simon Pender, 'After Peire, Vidal, & Myself' by Ted Berrigan, and 'From Dawn to Dawn: Troubadour Poetry' translated by A.S. Kline. This week's roll-call question was 'What is the worst threat you ever got', to which I did not have a particularly impressive answer ("I'll tell your mother!" back in primary school?). Anyway, this week's class was about the Troubadours who were popular back in the 11th-12th Centuries in southern France and parts of Spain and Italy. They are supposedly the inventors of love in Western songs. They created the love song (Canso), songs that comment on public things and gossip (Sir Ventes), and songs that were arguments between two Troubadours (Tenso). It was considered an aristocratic pursuit at the time. These people would write songs and poems and learn how to play instruments and then go around to royal courts to perform. The male Troubadours would usually pick a woman from the audience (usually the hostess) and sing as if he was singing to her. The point is that they were seducing someone publicly with their words and their instruments. The Troubadours were replaced by their impersonators the Jongleves, who created the Vido (a short bio of the original creator of the song) and the Razo (an account of the song's composition). Later in the class, we talked about people who make themselves out of fictions or develop their own madness, Quixotic (kee-oh-tee). And we talked about how when we are writing, we have to remember where we come from (though we don't necessarily have to write about ourselves). Readings: 'Little Red Riding Hood' by Charles Perrault, 'Little Red Cap' by the Brothers Grimm, and 'Little Red Riding Hood and the Wolf' by Roald Dahl. If you didn't guess by the reading list, this week we were studying fairy tales, specifically Little Red Riding Hood. The thing about fairy tales is that they were not originally told for children, and what we know as 'fairy tales' today are merely adaptions of stories that were first made for adults. The point of us looking at all three different versions of Little Red Riding Hood listed above was to see how children, specifically little girls, were portrayed over the different periods of time when each of these stories were written. Before we nosedived into the analysis of these three LRRH stories, we took a look at the conventions of a fairy tale. Settings: forest, castle, cottage, village, etc. Characters: peasants and royalty, magical/mythical folk, talking animals, etc. Iconography: glass slipper, spinning wheel, red apple, red hooded cloak, etc. Narrative elements: minimal detail, flat characters, repetitions (in 3s), happy endings (in the children adaptions) etc. Then of course we have the element of story: a full sequence of events in 'natural' order and duration, and plot: a pattern of events/situations arranged to emphasise (cause and effect) relationships and to evoke certain emotions. We took a look at these conventions in relation to LRRH. The setting inside the forest on her way to grandma's house is a metaphor for danger and we can easily place Red, Grandma, the Big Bad Wolf, and the Huntsman into the six character roles: Giver/receiver, subject/object, and helper/opponent. In fairy tales, there is binary opposition, where everything is set in pairs of opposite and there is no overlapping between good and evil. We also talked about sexism and gender roles in texts like fairy tale; how the women always need saving by men (Little Red and Grandma), and there are two types of men, the ones who save you (the Huntsman) and the ones you need saving from (the Big Bad Wolf). Little Red becomes less helpless (and more violent) in the more recently written versions of the story. Readings: 'Putting Yourself on the Line: Autobiography, Memoir, and Personal Essay' by P Gerard, 'The Art of the Dumb Question' by H Garner, 'Introduction' by I Glass, and 'Beauty: When the Other Dancer is the Self' by A Walker. This week was focused on writing about the self. The point of personal essays and memoirs and autobiographies is that we are trying to make what interests us resonate with others. In the words of Philip Gerard, "The best personal essays are usually about the self in relation to a world beyond the self." When we analysed the readings above, we did so with Huxley's three poles in mind. Huxley's three poles are three different ways of writing: personal and autobiographical; objective, factual, concrete-particular; and abstract-universal. Our goal when we are writing, especially a creative nonfiction personal essay, is to make the transitions between these three types of writing seamless so that it doesn't distract the reader. That concludes classes for this week. What are your thoughts on the genre vs literary fiction debate? Which class are you most interested in? Have you got any lessons of your own to share? So considering that I want to tell you guys about all four of the classes I'm studying at university this trimester, I've decided I may as well just do it all in one blog post every week. So this will be the first Saturday Summary of all the classes I had this week. Feel free to scroll down to the headings you are interested in and skip the rest. Of course, as it was the first week of classes, there was a lot of generic introductory stuff, which means future posts will probably be longer than this (and I may end up reconsidering doing this all in one post...). This is the class that kick-starts the week for me! Our readings were 'Learning Writing Through Reading' by Nigel Krauth and 'The Sentence in Time' by Kevin Brophy. In the Krauth reading, we looked at the process of reverse engineering, and specifically how it happens in writing. This is when someone pulls apart a story to see how it was made. This is often done with the intention of recreating the story being told. This process sometimes happens subconsciously. More consciously is when it is done because we're thinking about what doesn't work in a story, and what sticks out like a sore thumb. Reverse engineering to find out how something does work often happens subconsciously because unless we are intentionally thinking about how something works, we aren't going to sit there pondering. When it works, it won't distract us from what we're reading, so we don't consciously notice it unless we are looking for it. How many of us writers have read a 'how-to' book? This is reverse engineering from the perspective of another writer. While knowing how to reverse engineer is useful, we have to be careful not to emulate somebody else's work, otherwise we will never write with our own voices. Instead, we should be using this process to find out why we respond to things the way we do. In the Brophy reading, we examined the creation, use, and purpose of sentences. Sentences in fiction are not all about grammar and punctuation, but about having an experience. As writers, we should be using all of our senses when we form a sentences. Words on their own might mean something, but when we string them together into sentences, we expand their meanings into stories. This week, we looked into the myth of the myth-maker, Orpheus, the first Greek poet, among other things. We looked at the translation of a poem 'Orpheus and Eurydice' by the Roman poet Virgil, the more modern interpretation of the story called 'Raw Shock' by Toby Fitch, and 'The Sonnets of Orpheus XIII' by Rainer Maria Rilke. Just a heads up: my teacher for this class, from what I gathered this week, is an absolute basket-case. In other words, I love him, but it's harder to make a coherent, smooth-flowing blog post out of the notes I took. We started the class by answering the questions 'What king of a stain are you?' when he did the roll-call. Then we went on to some Greek words, like poiesis: to make. The prejudice of poets is that the whole world is made through poiesis. The point of writing poetry is to push yourself into thinking: what's the most I can know? Orpheus was a semi-divine being according to Greek mythology. This led us on to a discussion about why the gods don't write poems. They are not facing death. But then, what is scarier? Knowing you will die, or knowing that you will live forever? As soon as we start writing poems, we become Orpheus. Poets are fetish-ers of words and in the 21st century, there is nothing that can't be put into a poem. I've heard a lot of people saying that all love stories come from Romeo and Juliet, but if you look further back, my class now sees that they all come from the story of Orpheus and Eurydice, even if the author isn't aware of it or doesn't choose to name them as such. The only way to write poetry is to read poetry. When we try, we aim to write an emotion as that emotion, rather than just as a representation of that emotion, so that it plunges the reader into the experience. Our reading for this week was 'Why Assumptions Can't be the Whole Truth' by Perry Nodelman and Mavis Reimer. Children's literature is one of the few categories specifically defined by the audience's age, and is a generic term that covers literature for children from infancy through to young adults. Purposes of children's literature is to help that age group understand the world, including values and culture. There are always people controlling children's texts: governments, institutions, industries, creators, teachers and librarians, and of course parents. However, sometimes the things these controllers do and don't let children read is determined by assumptions that are not always accurate. The idea of 'childhood' is a social construct and society's ideas about childhood has changed over time. It has been shaped by adult ideologies and assumptions. The belief that is widely held is that children's literature should reflect the image we have of children themselves: happy, colourful, innocent. However they also think that children are of lesser intelligence, wild, and lacking discipline. They think children are subconsciously sexist (that boys only like reading stories about other boys, and girls only like reading stories about other girls). Often, the people who control what children do and don't read believe in contradictory ideologies and assumptions. They think that if children read about bad things happening, they will do bad things. If they read violence, they will become violent. In class, we did some myth-busting and thought of some really good examples of texts that break these ideologies. For example, my favourite picture story book 'Jenny Angel' by Margaret Wild has a very sad ending, but it didn't traumatize me and make me hate reading like the assumptions and ideologies said it would. I loved watching 'The Lion King' and reading the 'Harry Potter' books, even though they were about boys. I didn't become violent when I saw violence, like in the movie of 'The Lion, the Witch, and the Wardrobe' when Aslan's army fights the White Witch's army. Our readings for week 1 were: 'The "everything you ever wanted to know about creative nonfiction, but were too naive and uninformed to ask" workshop stimulation' by Lee Gutkind, 'Twenty Ways to Talk about Creative Nonfiction' by Sondra Perl and Mimi Schwartz, and 'Reaching one thousand' by Rachel Robertson. Personal essays talk about something relevant to a wider audience through a personal experience. It's not just about 'What happened to me', but 'what happened to me in relation to the subject at hand'. When writing creative nonfiction, we implement the skills we learned from writing fiction (storytelling, scenes, subjectivity, suspense, frame) with the nonfiction skills of information, structure, research and interviews, and focus. Creative nonfiction is used to teach something and the scenes are the building blocks. The scenes are separated by little blocks of information in a structure that engages the audience enough to want to keep reading, then informs them about things they need to know to understand the story, before drawing them back into said story with another scene. Which of my subjects interest you? Also, what are your thoughts on the all-in-one blog post? I don't know how else to share this stuff without inundating you with a minimum of four blog posts a week with whatever else I want to share in more posts on top of that... What do you think about my first week of classes? Have you learned anything writerly recently? Have you ever gone over something you've written and said to yourself, wow, did I write that? But it's so good! It could have been one sentence, or a couple of words of dialogue that suited your character perfectly. It could have been a few lines, or a whole paragraph. Or maybe you were blown away by a whole piece that you wrote and didn't realise the awesomeness of at the time. I was reading through some of my writing from last year and I came across the piece that was published in the Imagine 2013 journal by my university and I found a few lines that I realised I really loved. "Why did we choose this life?" she whispers over the conundrum of waves and wind and rain. Her eyes rest on the sky, unfocused. "Because we were more afraid of death than we were of eternity." Of course, it sounds way cooler in context. I don't know why, I am just really proud of those few lines. Anyone care to share a line or two of something you wrote that you're really proud of? I finished reading this a couple of weeks ago. It is probably the longest book I've ever read and it was amazing. We were given point of view chapters from Tyrion, Bran, Theon, Davos, Catelyn, Sansa, Arya, Daenerys, and Jon Snow. I would consider Tyrion to be the main character of this particular book, although the others are all masters of their own story-lines. I don't think there was nearly enough Daenerys in this book, but that's just me personally. Bran chapters actually began to serve a purpose rather than just to use more words, which was nice. It's hard to pick between Tyrion and Jon Snow for my favourite characters in this particular book, because I really loved both story-lines for different reasons, so I'll say I loved them both. Arya is pretty great too. My least favourite chapters were probably Theon's, because he's just such a jerk! And that's putting it nicely. I didn't fancy Davos much either, but that was mostly because his chapters were very descriptive. The Battle of the Blackwater was pretty good from his POV for that reason though. Point of view characters aside, George, seriously, soooo many named characters here that are so hard to keep track of, especially during battles. Overall, I think this book moved along pretty slowly, though not to the point where it was boring. Things picked up nicely during the Battle of the Blackwater. My favourite part was probably between Jon Snow meeting Ygritte, and Daenerys's adventure in the House of the Undying. Again, for completely different reasons, which makes it hard to choose between them. The setting is much the same as it was in the first book, with the exception of Jon Snow and his entourage moving north of the Wall. It has been explored a little in the first book, but it went a little deeper with details and further from the Wall this time. Daenerys is still on the other side of the Narrow Sea and ends up in the beautiful city of Qarth after a voyage across a desert. And with the introduction of Davos as a point of view character, we have had some insight into where Stannis Baratheon has been in Dragonstone, and we are also introduced to the castle at Storm's End. Catelyn introduces us to the Riverlands around her home in Riverrun and the Twins where the Lord Frey lives. Theon's point of view chapters take us to the Iron Islands and Pike, which has a very different feel to the rest of Westeros. It made me think of pirates. Many of Arya's later chapters are set in Harrenhall, which I think she is brilliant at portraying with its superstitions and all. Martin does a great job portraying all of his settings, both continuing from the previous book and new in this book. His overall style was as good as it was in the first book, with phenomenal worldbuilding, far too many characters to keep track of in one scene, and too much description of what people are wearing. Most if not all other details contributed to the awesomeness of the book. A little pet peeve I have developed: when he describes something 'like so many (noun)'. I don't know why. I think the first time struck me as cliche, and every time after that it just irked me more and more. Maybe I'm just crazy, but I thought I'd mention it. "Strike hard and true, crow, or I'll come back and haunt you." That whole scene with Jon Snow and Ygritte made me so excited. I mean, I already know what happens, because I've seen the t.v show (does most people say it the other way around? :p ), but I still loved reading that scene for the first time. Overall, great book, and I can't wait to get stuck into the next one. Now, I should probably go to bed and get some much needed sleep. Ressie o-week has gone, and the university o-week is about to begin! 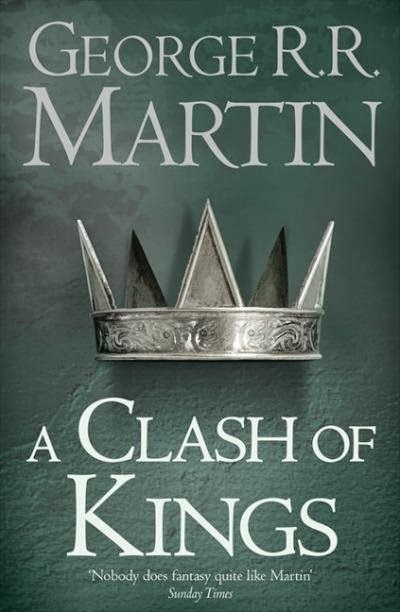 Have you read A Clash of Kings by George R.R. Marin? What did you think?